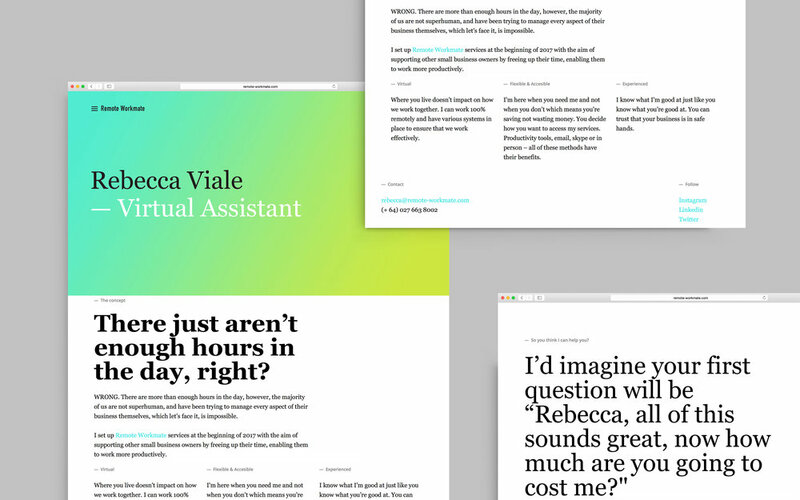 Remote Workmate is a Virtual Assistant based in Queenstown who provides freelance administration and business support services to busy sole traders, freelancers, consultants and small business owners. We worked to integrate a crafted quality to a service that often favours a digitally impersonal approach, creating a rich brand identity experience across stationery sets including business card and various letterhead templates, as well as brand guidelines and website. Remote Workmate required, in a clear and highly recognisable manner, to communicate with their clients without wasting time. Time is a very precious commodity, and as our client is a 'Virtual Assistant' who creates time for clients by efficiently undertaking administrative tasks, we needed to support this brand value effectively with the brand identity. To generate a clear visual identity, we worked with large typographic packages that summarises part of their service in a friendly way so that in an instant the services and the possibilities that it offers are understood. With regard to the colour palette we decided to work with bright colours ranging from blue (Sky) to green (Earth). The idea is to go through the range between these colours generating a gradient, as an analogy of the variety of services offered by our client. Assigning a single colour would have been restrictive, since a fundamental value of the business of ‘Remote Workmate’ is the multiplicity of services. The brand is created to be a modern element, serving as a part of the brand expression, rather than a corporate signature, not separating itself or suggesting any hierarchies. Old and condensed characters mixed with a stylish serif font, and alongside a bright colour palette provide impact from a distance, achieving a dynamic, distinctive and consistent brand identity.